Thanks a lot Richelle for this award. I received this one already, but it was on my other blog. 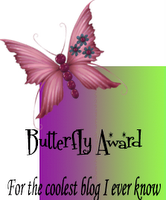 So, this time, I'm proud to take this award for this blog. :). Thanks for the frequent visits too sis. For sure, sometime, I will have frequent visits on your blog a well. I know, I'm guilty right now, as I haven't been around these days to do my blog hops, LOL. Anyway, this is a treasure for me...thanks a million from the bottom of my heart!